Previous PostSea Control 7: Defense Knitting CircleNext PostHoly Bovine, Batman! Sacred Sailors! I liked your article – however, I have a slightly different perspective on the concept of quantity over quality I’d like to offer. Perhaps it is seen as quantity that the CNO is trying to field but I believe that with consideration to the US getting it’s fiscal house in order, Navy is offering a solution that changes the mix of capabilities fielded in the form of type/model/series. This solution is definitely far less capable than what could be put forward with appropriate resources- but now is not the time to offer those solutions. So I offer that the US Navy is attempting to provide a balanced approach of being forward…to achieve strategic objectives with risk…risk that high end combatant forces will not be required in particular AORs. This strategy does reduce the US Navy’s ability to swing credible combat forces to certain crisis. But I’m willing to bet that the US believes certain crisis will not occur for a period of time. Thus the risk is acceptable but still leaves an unsettling feeling. In the end the Navy will always produce the best quality products – they may just have reduced capability from what has been fielded in the past. Good post! You should also check out the small vs big ship force structure debate involving CDR Pournelle on Info Dissemination, ADM Harvey (and others) in Proceedings (“Flotilla Navy”) and ‘Lazarus’, also Info Dissemination and here. My only quibble is your opening line “US naval forces have been largely unchallenged at sea since World War II.” If today the U.S. is facing the challenge of the PLA(N) and regional cooperation in the Pacific, did not the U.S. in the Cold War face the challenge of the Soviet Navy across several global theaters? Well put. I think we should send all of the Naval Academy’s YP’s overseas to act as patrol craft. They are small. Admittedly they do lack in speed but we can get them for cheap. The USN preference for quality over quantity goes back to the apparent success of the 44 gun frigates in the War of 1812, except that we may have gotten the wrong message. Actually the British won the naval war, with their individually inferior, but vastly more numerous frigates and smaller cruisers, wiping out our trade and bottling up our fleet. In WWII, it was the Japanese who placed greatest emphasis on quality vice quantity, while the US employed a high-low mix. We know how that turned out. Of course, industrial potential played a big part, but looking at the relative strength of China’s ship building industry, there may be a lesson there too. This is precisely what I have been pushing to the US Navy and Global Navies for over a year but my efforts have fallen on deaf ears. My company has a series of carbon fiber foil assisted High Speed Pocket Patrol Boat catamarans (HSPPBs) that are ready to be mass produced in production molds at a price that is 20 times less than one JHSV. Just like the JHSVs the HSPPBs can achieve speeds of 40 knots with a range of 2,000 nautical miles but using just 11,000 USG of fuel, which is another huge budget saving feature. Mass produced, dozens of HSPPBs can be deployed to saturate the most hostile areas with an intimidating display of “our eyes are on you”, while they wait for “big boy” back up to arrive if called for. With four M242 Bushmaster 25mm auto-cannon weapon systems they may not be a formidable force to reckon with against warships, but it would give them protection against maritime criminals which is the target area they were originally designed for four years ago. The Chinese Navy already has built over 80 missile capable high speed catamarans since 2004 and although they would be no match for modern warships, aircraft and submarines they do represent a significant deterrent inside China’s 200 nm economic zone and at very little cost. We have just now been contacted by a Middle East country with money to invest stating, “We seek individuals / organization, with profitable business ideas or any viable project to partner with and finance by making investment”. Of course after due diligence we have taken them up on their offer and are trying to put together a deal that will allow us to lease Huntington Ingalls Gulfport, Mississippi facility and retain many of their 400 experienced carbon fiber workers that will be laid off by the end of the first quarter of 2014 as HI moves to close down this facility due to US Navy cutbacks. I think you’re driving towards my favorite Admiral’s “High-Low” concept. ADM Zumwalt attempted to keep the quality while building in a “quantity” component (FFG-7 class). While smaller ships may offer the “presence” akin to 19th century gunboats, they are mostly unfit to actually fight if called upon to do so. 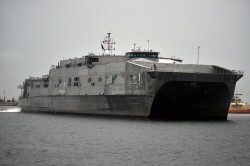 The LCS is about the smallest type of US warship that can conduct “gunboat” missions an still combine with larger naval formations to fight in high end conflicts if required. If the Chinese really want to start a fight in the Western pacific they will undoubtedly seek to neutralize the forward bases these small ships must use, leaving small warships out of fuel, without air cover,and at the mercy of much larger Chinese formations. Great Britain, the last nation required to maintain a global naval presence made the decision to cut its gunboat force in favor of larger vessels with higher endurance when faced with significant naval budget cuts before World War 1. In the current fiscal environment, the U.S. must equally eschew small craft in favor of ships with high endurance capable of rapid deployment throughout the globe in support of our interests. As Britain’s iconic naval leader Admiral Sir John Fisher said, “gunboats are too weak to fight and too slow to run away.” The same situation applies today. The U.S. must reject this drift to small combatants. They might have been suitable during the U.S. “unipolar” moment of the last 20 years, but in the face of Chinese, Russian and Iranian naval threats, they no longer make sense.